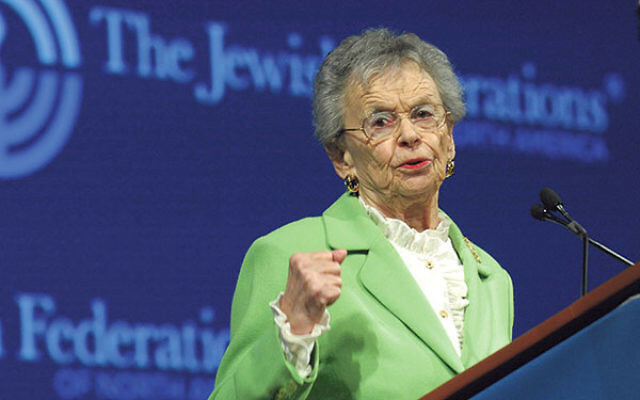 Levine spoke of her battles for social justice at the General Assembly of the Jewish Federations of North America in November 2012 in Baltimore. Now that she and her husband, Howard, have relocated from their West Orange home to the Crane’s Mill retirement community in West Caldwell, Jacqueline and her family are donating her personal archives — seven cardboard boxes filled with newspaper clippings, photographs, and other artifacts — to the Jewish Historical Society of New Jersey. “My brothers and my father and I are thrilled that the Jewish Historical Society is going through Mom’s papers,” said her daughter, Ellen, who made arrangements for the archives to be donated there for safe-keeping . Once society staffers catalogue, digitize, and sort the material, they plan to exhibit part of the trove at the Aidekman campus in Whippany, where the JHS is headquartered. No date has been set for the exhibition. But once it is open to the public, students of American and Jewish history can make up their own minds about Jacqueline Levine’s most significant contributions. Born Jacqueline Koldin on Jan. 28, 1926, she grew up in a secular, Jewish, socialist household in New York. Her first political involvement dates to the mid-1950s, when as a member of the American Jewish Congress she protested the civil liberties violations of the McCarthy era. After marrying Howard Levine in 1949, they began a family. Their daughter, Ellen, was born in 1951; their sons, Stephen in 1953 and Ned in 1958. The Levines lived in North Arlington before moving to West Orange. Even as a dedicated wife and mother, Jacqueline always made time for political involvement. Howard recalled — in an Aug. 15 phone conversation that Jacqueline and Ellen also took part in — that his wife’s “first activism that I can remember was Jackie taking Ellen to picket Woolworth’s in Newark” to protest against the chain store’s discriminatory hiring practices and segregated lunch counters in the South of the early 1960s. Her commitment to racial justice included joining her rabbi at Temple B’nai Abraham (then in Newark, now in Livingston) — the renowned civil rights activist Joachim Prinz — on the August 1963 March on Washington, where he addressed the throng immediately before the Rev. Martin Luther King Jr. delivered his “I have a dream” speech. Two years later she joined King and thousands of others in Alabama on the march from Selma to Montgomery. Jacqueline was also heavily involved in Jewish causes. In 1964 she and 11 other members of the American Jewish Congress, led by Prinz, were arrested while picketing at the Jordanian Pavilion at the New York World’s Fair. They were protesting a mural at the pavilion inscribed with a poem that included references to the Palestinian refugee situation and condemning “strangers from abroad” who had brought strife to the region. The demonstrators said it was a “libel” against Israel and the Jewish people. “They were arrested and strip-searched before being released,” Howard said. “Then something funny happened. Ned, our youngest son, was in school when she was arrested, and the next day his friend Tommy — confusing two words — announced to his class that ‘Ned’s mother was arrested for pickpocketing,’” confusing that charge with picketing. In the 1960s and early ’70s Jackie took part in frequent demonstrations against the war in Vietnam. Then, in 1986 and ’87 she served as national chair of the Mobilization for Soviet Jewry, which brought 250,000 American Jews to Washington on Dec. 6, 1987, to protest Soviet repression. There she was arrested for a second time. It happened at the Soviet embassy in a protest against the USSR’s treatment of Jews. “It was not quite so harrowing for me as the first time,” when she was arrested at the World’s Fair, Jacqueline said later. After spending the night in jail, she and others pleaded no contest, and went home. But it took three years to clear her record. In 1985, Jacqueline became a founding member of MAZON: A Jewish Response to Hunger, an organization that works to end food insecurity in the United States and Israel. She was also a founding member of Jewish Funds for Justice, which supports Jewish alliances for social change. Many examples of her dedication are now boxed up in the JHS archives, and her daughter is pleased about their relocation.